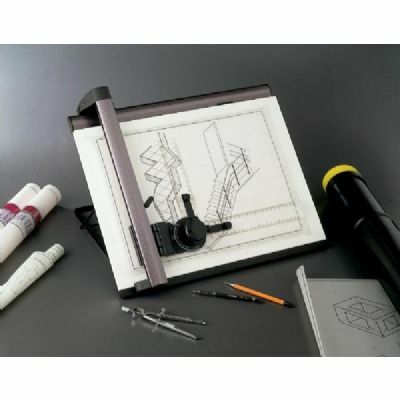 Track-type drafting machine complete with drawing board that features a modern and compact, precision design. Functional drawing board with precision ball bearing, vertical sliding track drafting system, and break lever on vertical sliding track offers three positions. 150° double-hinged drawing head with two sets of plexiglas scales included, one set metric, the other is in full and half inch graduations. Complete system weighs 20 lbs. 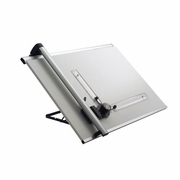 with a work surface area of 19 ½"h x 22"w. Adjustable stand allows board angle at 0°, 20°, and 45°. Can be used along with CAD furniture set up. Carrying case protects parallel straightedge and provides convenient portability.